Yoke: Recital Week: Falling, fake hair, tulle, tiaras and the glory of the dance. Recital Week: Falling, fake hair, tulle, tiaras and the glory of the dance. It is recital week. I never danced in recitals as a kid. My father tried to interest me in tap dancing; but all that tapping and noisy walking were a bit much for me. It was all so "Singing in the Rain" and I was more "Set Fire to the Rain," even back in the 80's and preferred to be writing a memoir about my dreams of a pet lion or drawing a mural dedicated to Nancy Drew; than tapping my feet in an organized fashion. No one told me about the costumes or the chance to be on stage. Or the potential for adult-sanctioned make-up. 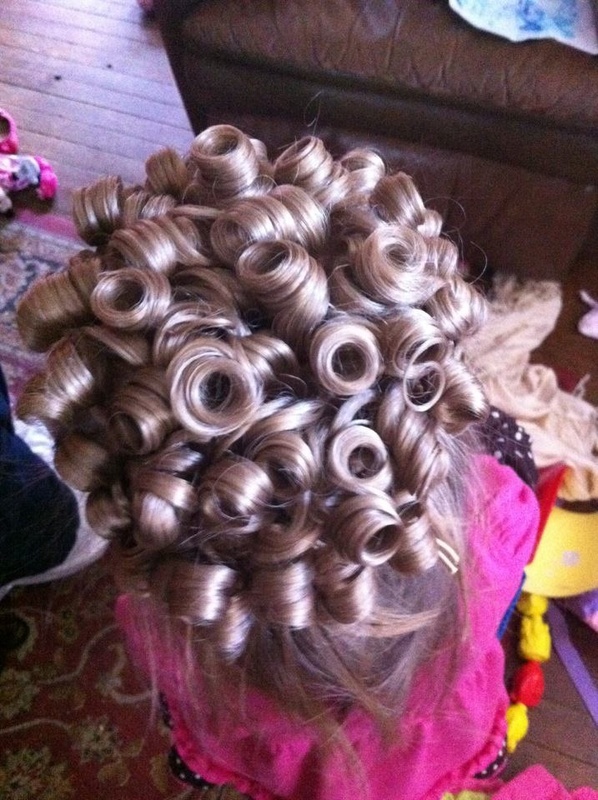 Perhaps then I would have tapped my little heart out for the glory of glitter and curls. I started Lily in Ballet and Tap about nine months after she started walking--at the ripe old age of 4. Lily was still finding her balance. She was, in many ways, still recovering from her brain tumor diagnosis--we all were. Her walk was hardly smooth. And her gait was irregular. It took all her brain power to walk in a straight line. And the tap portion of her class was akin to ice skating: tap shoes are slippery and Lily was lucky she could shuffle; let alone stomp her feet. But, I saw a news story about a man with cerebral palsy who found his walking and gait and balance improve through the steady, smooth and strong moves in dance. I knew this could be therapy for Lily. And so it was. I know it was hard. I know she was scared. I know the teacher may have thought I was in denial about Lily--that she should wait to try dance when she was stronger or maybe she should never try dance classes. But, I wanted dance to make her stronger. And I will never tell Lily she cannot do something. So she danced. And she fell. And she cried. And then outside of dance class, I noticed she could run. I noticed in yoga, she could balance on one foot. And I noticed at parties, that Lily shined. 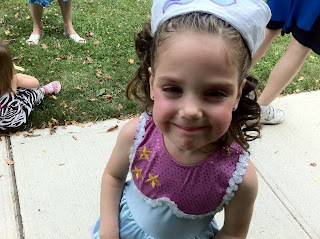 She partied like a preschool rock star. She had confidence. And so here we are again. Our second year of dance--something that I know many think is frivolous or ridiculous; that maybe I should be spending more time at the library. Or putting dance tuition money towards their college educations. Or investing our time and energy into more traditional physical therapy for Lily. Or maybe, Chloe, who started dancing at 2 1/2 because she begged me, should just be free playing, because she so young. But, dancing is so much more than the recital. It is the journey--the work over a year of challenging yourself physically; building new pathways in your brain; thinking and remembering routines; listening to your teacher and disciplining yourself to show up each week. It is a year of falling and a year of getting back up. It is a year of standing with your chin up and a smile, even when your heart is beating out of your chest. It is training ground for dealing with failure and then pushing through what you believed to be your limitations. Because in dance, there are no limitations to the beauty and the glory that can shine on a stage. And this week, through all the hairspray, tulle, fake hair and bobby pins: we celebrate. We celebrate our two little dancing queens and know one day when they are mothers or inventors or artists or doctors or even dancers, they will be able to fail. And stand right back up with a smile (and a little sprinkle of glitter).